CALSTAR Flight Nurse Ernie Acebo is part of the team trained to handle all medical emergencies. Five minutes. From the warning bell in crew’s quarters to lift-off from the tarmac, that’s all the CALSTAR flight crew has. Even if they have been jarred from a deep sleep, the pilot and two flight nurses are up, dressed and flying off in five minutes or less. Once in the air, the pilot contacts dispatch again to receive actual latitude and longitudinal directions and the name of a ground contact. Flight rescue has been called to assist for a number of reasons, but usually it’s because of ground traffic delays, the accident is far from a trauma center, or because they can provide additional medical interventions at the scene. Either way, the crew is trained to handle all circumstances: they are Certified Critical Care Registered Nurses, Certified Flight Registered Nurses, and certified in Pediatric Advanced Life Support, Advanced Cardiac Life Support, and Neonatal Resuscitation. CALSTAR has 10 bases throughout California; Northern Solano County is served by a base located at Vaca-ville’s Nut Tree Airport. From here, a three-person crew could be called to the Delta waterways or Lake Berryessa, from Fairfield to Winters or Woodland in Yolo County. Some flights have even gone as far north as Fort Bragg. “We do whatever we can to save a person, to get them to a trauma surgeon. Our goal is to be overhead the scene ASAP,” Castelli says. In large emergencies, CALSTAR could receive backup flight rescue assistance from other CALSTAR bases, or helicopters from REACH or the California Highway Patrol, based in Contra Costa, Napa or Sacramento. 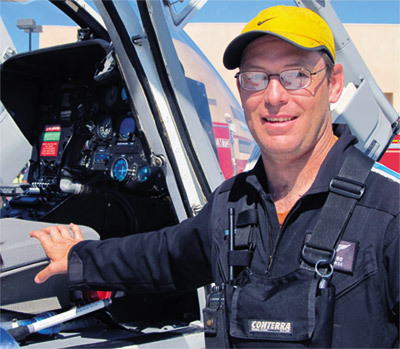 Castelli has been a flight nurse for 10 years, but it wasn’t his original career path. As a nursing student at UC Davis, he saw the helicopters landing at the nearby medical center and became curious about their mission. After going on a “fly along,” he was sold on the concept.